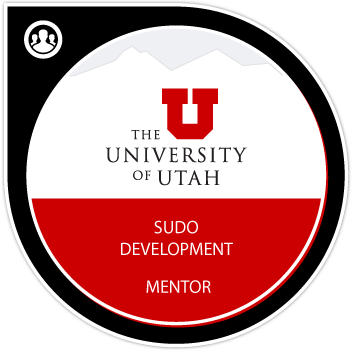 Badge earners have mentored students in the selective University of Utah Student University Development Opportunity (sUdo) program. They have worked with students for at least one semester in the field of Development. Mentors are able to implement an on-boarding and training program and conduct monthly performance reviews. They are able to provide performance feedback in a constructive manner and identify performance gaps. Mentors help students set monthly goals and tasks.